Someone at work brought nearly 20 bananas to give away. Because my biggest pet peeve is wasted food, I had to take them and make it my mission to come up with something to use them in besides banana bread (although I looove me some good nana bread). After the big bike ride, Kiley and I deserved a cake. Also, it was our 6th wedding anniversary…so another great reason to make a cake. And it was a rainy sunday…and hey, I wanted cake. SO there. In this adaptation of a Dave Lebovitz cake, I used more natural foods instead of processed items. I made a few easy swaps, such as honey instead of white sugar, whole wheat pastry flour instead of all purpose (AP), and greek yogurt instead of sour cream. I have really tried to remove white flour and white sugar from my cooking, using minimally processed natural sugars, such as honey, maple syrup, and agave nectar. Next time, I will likely use maple syrup in the caramelized topping instead of the brown sugar that is in the original recipe. Whole wheat pastry flour is less dense than regular whole wheat flour and is perfect for baking. This cake was still very moist despite the whole wheat flour. If you don’t have access to whole wheat pastry flour, then you could use half AP and half whole wheat. Seriously, this tastes like a banana foster cake with amazing warm bits of chocolate. I would definitely recommend eating this the day you bake it….warm….with vanilla ice cream. Be ready to get your mind blown. And for you banana haters out there….I totally feel sorry for you. This is fab. Topping – Spray 8X8 pan with pam. Mix brown sugar and water in pan. Place in preheated oven for 5 minutes. Remove and let cool to room temperature. Peel and slice the bananas in 1/4 inch slices. Arrange the slices over the melted brown sugar topping in tight rows. Drizzle with a few drops of lemon juice to keep the banana from browning. Whisk together the whole wheat pastry flour, baking powder, baking soda, salt, and cinnamon in a large bowl. In a small bowl, mix together the honey, melted butter (cooled…don’t want to cook the egg), egg, egg white, banana puree, yogurt, and vanilla. Make a well in the center of the dry ingredients and stir in the wet ingredients until almost combined. Gently fold in the chocolate pieces. Do not over mix or the cake will be tough. 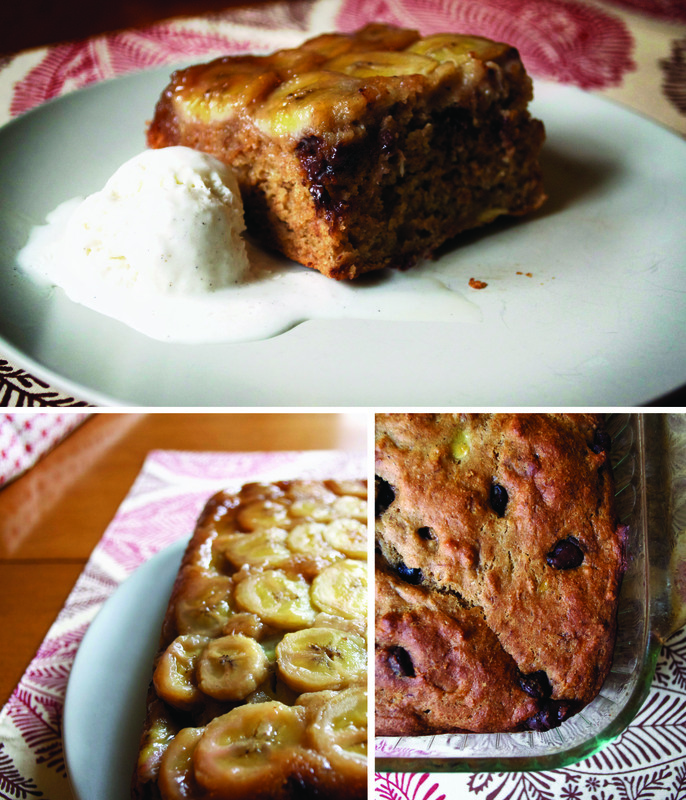 Using a spatula, scrape the banana cake mixture on top of the bananas and carefully spread over the sliced bananas. Bake for 40 minutes in an oven preheated to 350F. Cool the cake for 20 minutes (if you dare). Use a knife to separate the cake from the edge of the cake pan. Flip over and place on a platter.